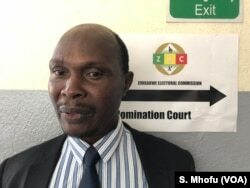 Japhet Murenje, the head of nomination court in Harare on June, 14, 2018, announces the names of the candidates who will run for Zimbabwe’s presidency in the July 30 general election. Nearly two dozen individuals have registered as presidential candidates in Zimbabwe’s upcoming elections. But some who did not make the cut are crying foul. Among the 23 candidates whose names were announced by Japhet Murenje, the head of the nomination court in Harare, are incumbent President Emmerson Mnangagwa, former vice president Joice Mujuru, and Nelson Chamisa, who is leading the coalition of most opposition parties. Priscilla Chigumba, the chairperson of Zimbabwe Election Commission, speaks to reporters in Harare, June 14, 2018. Priscilla Chigumba, the chairperson of Zimbabwe Election Commission (ZEC), said the registration process ran smoothly. “We are quite pleased the nomination court processes have gone quite well. All our preparations were on course. All of the aspiring nominees have been given adequate support by the ZEC, and I am quite pleased by the process with regards to the presidential nominees,” Chigumba said. Mapfumo Peter Gava, the head of little known United Democratic Front, failed to register for the July 30 general election and said Zimbabwe Election Commission’s refusal to give him the voter rolls made him unable to get enough nominees to support his candidacy. But not everyone is so pleased. Several small parties complained they were not given access to the official voters roll before Thursday’s deadline. Without that access, it was harder for candidates to round up the required 100 signatures of endorsement from registered voters. Mapfumo Peter Gava, the head of little-known United Democratic Front party, was one of the presidential hopefuls scrambling to collect enough signatures. “This is a very open election where most Zimbabweans are sitting on the fence. But because of this challenge, it then becomes very difficult that the voters roll has been produced very late. Most candidates had to go around to get people to sign for them,” he said. Gava failed to get the signatures in time to register. Other parties could not raise the $1,000 registration fee. Douglas Mwonzora, the secretary general of the main opposition party, the Movement for Democratic Change, is hopeful that the electoral process will be better than the previous ones. Douglas Mwonzora, is secretary general of the main opposition party, the Movement for Democratic Change, that successfully registered to take part in the July 30 election. “It would have been prudent to have the voters roll before nomination (court). But the ZEC says it is going to give us [it] after nomination. So we hope that the whole process will be good,” Mwonzora said. As the registration process was taking place, the Zimbabwe Lawyers for Human Rights group asked the High Court to order ZEC to furnish the voters roll to another opposition party, the National Constitutional Assembly (NCA). The issue could set the stage for a disputed election. The July 30 polls will be the first in Zimbabwe’s 38 years of independence without Robert Mugabe on the ballot. Mugabe resigned last November under heavy military pressure. Mugabe’s successor has lifted the longtime ban on Western election observers. But the opposition says that is not enough for a level playing field, pointing to ZEC’s refusal to release the voters roll. The opposition parties want the voters roll to be audited, saying that step is necessary for a credible election.